Norman Rush, author of Mating and Subtle Bodies, and his editor at Knopf Ann Close. 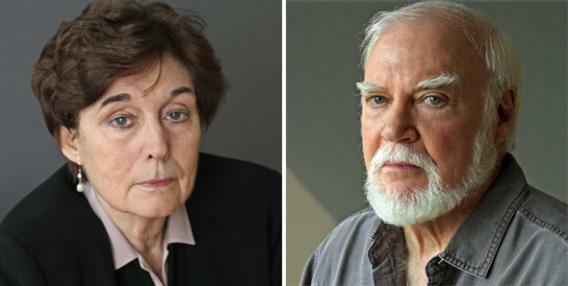 Knopf editor Ann Close and author Norman Rush. Ann Close has been editing Norman Rush since his first book, Whites, in 1986. The editor and the novelist emailed recently about Rush’s new novel, Subtle Bodies, out this month from Knopf. Ann Close: Our relationship has had a magical quality for me right from the beginning. We met one night at a dinner given by the author Tom Disch shortly after you and your wife Elsa had returned from Botswana where you were Peace Corps Country Directors for five years. The evening was fun and funny, and exciting in some indefinable way. I don’t think I’ve ever heard your side of that night. Norman Rush: Yes, that was a vivid evening for me, too. I was full of stories about Africa. Overflowing, you might say. And an odd phenomenon was that both Elsa and I were finding that no one asked about our experiences of the last five years. At least not beyond the basics, along the lines of, “Are you glad you went?” I think that what was fascinating to me was understandably categorized by others as something like vacation snapshots I had in my wallet. Close: At that point, you had had a couple of the stories that would later be collected in Whites published in The New Yorker, which I learned during the evening. I had a pile of old New Yorkers in my apartment, so I went through them when I got home and found “Bruns,” which opens the collection. I thought it was a perfect story, so perfect that I read it again. Still perfect. I got up early the next morning, read it once more, and felt the same, so I immediately called your agent Andrew Wylie, who sent me two more stories and an outline of a novel, which turned out to be Mating, and we signed you up. Close: As I discovered when working on the full Whites manuscript, you didn’t need very much editing. Your sentences are so inimitably yours, they’re not easy to edit, except to note repetitions, or to point out that something’s hard to get. I do remember having an argument with you over the ending of “Official Americans,” because I thought it wasn’t clear enough. You won, of course, but you did tell me later that you’d gotten a couple of letters asking for clarification when it came out in The New Yorker. I remember gloating a little over those letters. Rush: As an editee, I’m aware that I present a number of quirks. Over time, we’ve converged on a via media that works excellently. In a general way, I’ve resisted standard punctuation if it seems to get in the way of an effect I wanted. Our battles over the placement of commas have pretty much ended with a happy compromise. Although I like semicolons, I don’t like them in my own fiction. I can’t justify this prejudice except to say that it has something to do with flow. I read everything aloud until it sounds right to me, and what a semicolon, or dash, does, often doesn’t sound right read aloud. It occurs to me that it took Elsa and you both to curb my inclination to write insanely long scenes. Close: Although I had published the stories, which were themselves wonderful, nothing could have prepared me for the sweep and pleasure of reading Mating. As I remember you first gave me a section that left me stranded in the middle of the narrator’s gripping journey through the desert, and I didn’t know how I could wait for the next installment. Rush: An unforgettable moment in our adaptation to each other occurred when you returned a manuscript copy of the first part of Mating with a blizzard of green check marks in the margins. I interpreted them as suggestions to delete those passages. Very alarming, as these passages were some of my favorites! As it turned out, the green checks were markers for some of your favorite passages. Close: Once long after the book was published, I found the outline of the novel you’d submitted and I was amazed at how accurate it was. This had a funny consequence, because Subtle Bodies had changed somewhat from its outline, and I missed a major thrust of the book the first time through since I was anticipating a different turn of events. Rush: This is where I must praise your remarkable creative patience with me. Writing Subtle Bodies with the determination to make it a short, concentrated chamber work resulted in a heroic (from my standpoint! ), and crazed struggle against my recurring inclination to write everything I want to say. The book got out of control and was, more than once, over 400 pages. I’d promised and determined to take it downstairs to Elsa every couple of weeks as I progressed, mainly because she knows so well this tendency/compulsion of mine. Like an addict, I made excuses. I couldn’t possibly show her 400 pages of a supposed 180-page novel, and I couldn’t stop writing. I was in distress. In my defense, I’ll say that I didn’t respond calmly to certain interruptions of a personal sort. Hard things. Very late one night, I woke Elsa up to tell her I’d given up on Subtle Bodies. She got out a pad and started asking questions about what I’d done so far, and together, over hours, we deconstructed the novel, reducing it to its essence, which I’d lost sight of but which she was able to discern and persuade me of. So I began again, grateful for your patience, her interventions, and with the assistance of a course of Cymbalta, a drug prescribed specifically for focus problems by a psychiatrist Elsa located, I reduced the 400 pages to 236. I’d like though, both to tell what helped me and not to seem to recommend this drug: I started the weaning process the day I wrote the last words of Subtle Bodies, and even done gradually, the detox was a baroque and grueling experience for which I hadn’t been prepared. Close: Your novels Mating and Mortals are a unique mixture of social comedy in the grand tradition combined with political or intellectual argument. When it came to editing the novels, I think most of my suggestions were about cutting some of the political or religious arguments down, particularly in Mortals, which had grown very long. Did you mind? Rush: No. I knew what would happen with Mortals if I sent to you, for example, Morel’s takedown of Paul’s hijacking of early Christianity. You’re lucky it never reached you! You and Elsa colluded in cutting a byway about rock art in the Tsodilo Hills in Botswana. There was an overall feeling about more cuts being needed so as to get more quickly to the explosive (figuratively and literally) events in the Kalahari Desert, but when it came down to it, you were lenient, for which I thank you. Close: That reminds me to thank Elsa here, officially, for being the first editor of your work, making life much easier for me and more fun, too, since we often end up with the three of us having an opinion on a wording or something. Those discussions can last for several days and are stimulating to have. Your immense and sometimes arcane vocabulary gives your editor, copy editor, and readers a workout. Rush: Mating is I think the only book in which the issue of people resorting to their dictionaries has come up. I thought it was clear in the book, but I guess it wasn’t, as I still occasionally have to explain that Karen Ann Hoyt’s extensive vocabulary was built as part of her ladder up and out of her disadvantaged origins. It’s about her, of course, and not about the precise meaning of every word she uses. I should acknowledge that Karen didn’t like her name, and the reader doesn’t learn the narrator’s name until she reappears in Mortals. Denoon reappears in Mortals, too. Paul Ojang, the main character in the Whites short story, “Thieving,” also makes a cameo appearance in Mortals, stealing. Dineo, an important character in Mating, shows up in the shootout at Ngami Bird Lodge, toward the end of Mortals. Close: As you had written such politically astute portions of your previous two novels, I found it interesting that in Subtle Bodies, you had one of the two main characters, Nina, constantly make fun of the intellectual thrusts and parries of the five male characters (including her husband) during their college days, when they considered themselves a radical elite. Rush: This is a reflection of my real-life amusing and bracing encounters over political ideology over the years with Elsa. The Bakunin jibes are in fact verbatim (as are many other of Nina’s aperçus), and they recur from time to time despite the fact that I consider myself a reality-based, matured political intelligence! Subtle Bodies by Norman Rush. Knopf.